Electromagnetic Shielding is the practice of reducing the electromagnetic field in a space by blocking the field with barriers made of conductive or magnetic materials. Shielding effectiveness = A measure of the reduction or attenuation in electromagnetic field strength caused by the use of a shield between the source and that point. In terms of functionality, shielding radiated emissions at the presence of a seam or opening of the electronic product or system by reflecting, absorbing or redirecting electric/magnetic fields. 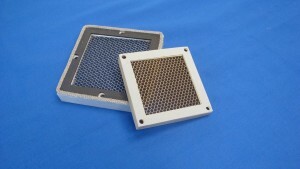 Nearly all high-speed, electronic devices require electromagnetic shielding in order to operate. Some examples are: computers, industrial controls, medical devices, telecommunication equipment, military and commercial electronic systems. 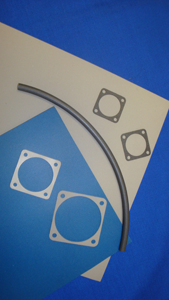 These and many other electronic devices and systems utilize electromagnetic shielding in the forms of air vent panels (Figure 1), conductive viewing windows (Figure 2), board level shields (Figure 3) and gaskets made of conductive elastomer (Figure 4), wire mesh (Figure 5) and Fabric over Foam gaskets (Figure 6). The shielding material to be used is largely determined, not only by the shielding needed per the operating frequency, but by the electronic product or systems intended use in an environment such as office, factory/warehouse, outside, and/or near salt water. Other affiliated physical environmental conditions that determine the best shielding material is galvanic compatibility of the shield material mating conductive surface, vibration, and temperature. 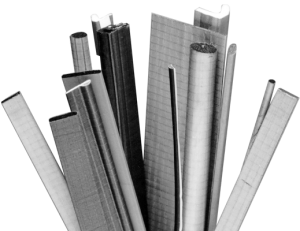 Contact MAJR Products Corporation for guidance on electromagnetic shielding and the correct shielding materials to use for your specific application.